Doug was with Hibs, Falkirk and Ipswich Town before he was signed by United. He was in the side for the next two months but in a surprise move he went to Falkirk in mid November 1964 for an undisclosed fee. Doug was born on this date in Musselburgh. After winning all three of their League ties, the commencement of the League season brought disappointment with 11,000 fans leaving Tannadice convinced they had just witnessed highway robbery. To be fair, however, at no time did United reproduce their League Cup form and failed to breach a stuffy Thistle rearguard. Partick took the lead on the quarter of an hour mark, when Billy Hainey blasted the ball past Sandy Davie. Four minutes after the restart, United got back on level terms, when Jimmy Briggs' longrange pass found Doug Moran who coolly brought the ball down and slammed it past Nivea. Almost immediately, however, Billy Hainey had restored Thistle's lead which, despite non stop pressure, United failed to negate. No goals — and nobody demanded a recount because although this match was not entirely devoid of good points, but net-bulging very seldom threatened to become one of them. 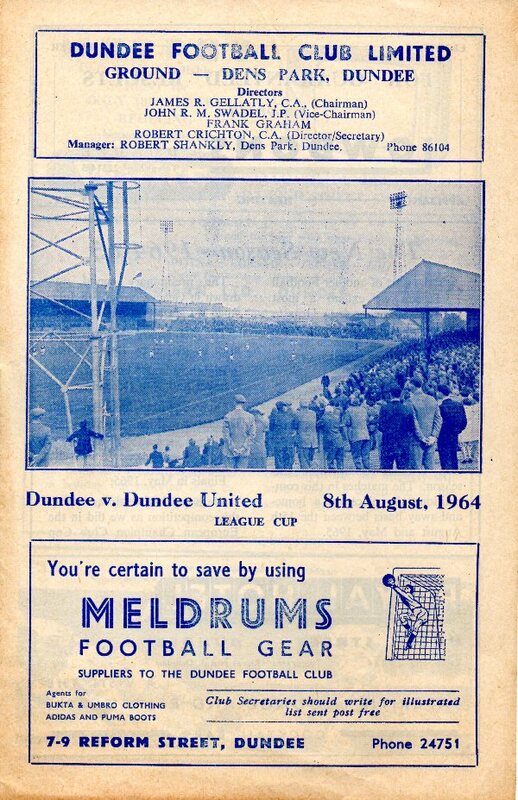 Bearing in mind United's plight, however, the Tannadice men were delighted to prise a point from Brockville, especially as Falkirk should have had both safely imprisoned by half-time. After the break, with Doug Soutar on the wing, Denis Gillespie at centre, and Johnny Graham at inside-left, there was a distinct improvement. Denis Gillespie had a header cleared by Lambie, Johnny Graham hit a post, and Markie had to clear a Soutar shot that had beaten Whigham. Not a classic but the end result was satistactory as it was only United's fourth point from eight outings.